My No-Sugar-Added Omega Peanut Butter Cookies were simple to make and reasonably tasty, but they didn’t achieve the “real thing” quality I was looking for. The texture was too dry and crumbly, and the sweetness was off. So, I have been experimenting once again, trying to come up with a healthy yet decadent tasting cookie. I’m almost there with this recipe. I was very excited when I made these cookies tonight. The flavor was great. The texture nearly resembled the chewy ones you pick up at the food court (still a bit dry, though). I thought I basically had it, that with a few more minor tweaks, I’d have created the ultimate healthy PB cookie… until I caculated the nutrition stats. 340 calories per cookie! Yikes!! That’s just NOT acceptable, no matter how clean they are or how much good-for-you protein they contain (over 12g per cookie, btw). Mix together the buttery spread, peanut butter and egg whites in a large bowl. When well blended and creamy, add the Splenda and brown sugar blend. Mix until light and fluffy. Add the vanilla and salt, and mix again. Finally measure in the baking soda, baking powder and flours. Stir until well blended. Shape the dough into balls about an inch in diameter. Arrange them on a cookie sheet. Spray the bottom of a glass with non-stick pray and press to flatten each cookie. Then, use the tines of a fork to create the classic cross-hatch pattern. Bake the cookies, on a cookie sheet coated with non-stick spray, at 375° for about 10 minutes. Cool slightly before removing from the sheet pan. Makes about 30 fairly large cookies. Adapted from a recipe on the Hillbilly Housewife’s website. Entry filed under: clean eating, diet recommendations, food review, health, recipes. 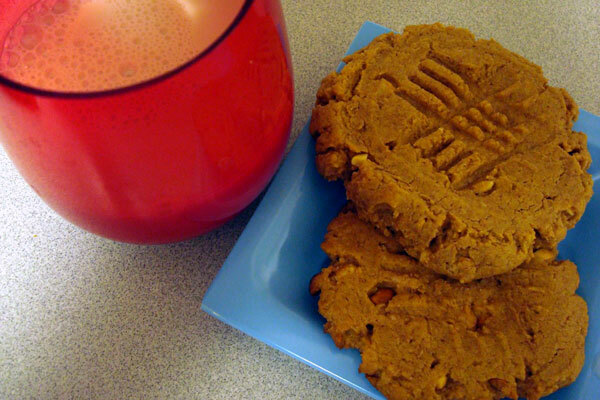 Tags: healthier peanut butter desserts, low sugar cookies.